Shirley Ann Shumaker beloved wife and best friend of Bruce Steven Shumaker, passed away on August 1, 2018. 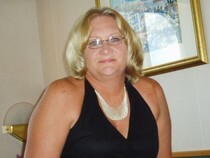 Beloved mother of Christopher Shumaker, Kelly Shumaker and significant other Maurice Thomas. Beloved Grandmother of Marquese and wife Labiba, Brandon, Kristen and husband Steven, Christopher and Kyle. Beloved Great Grandmother of Kristina and Mylah. Beloved Mother of her late American Bulldog Dakota whom had her wrapped around his paw. Daughter of the late David Woodward and Dorothy Woodward. Sister of the late Leon David Woodward. Beloved niece of her Uncle Burl and Aunt Peggy who raised her after her parents became ill. Survived by many close friends and loved ones and especially her girl Jeanie. Shirley loved doing for others. She loved the outdoors, boating and fishing. Loved spending time with her family and traveling with her husband. She especially loved the cruises they enjoyed together. There was an ongoing joke between the two of them that stuck and they became known to each other as Maw and Paw and weren't afraid to use those titles everywhere they went. She was known as Nanny by all the children in her life related or not. She will be greatly missed and loved forever. Rest in Peace and watch over us always. A Celebration of Life will be held on Saturday, August 18, 2018 from 1pm to 4pm at St. Paul United Methodist Church, 21720 Laytonsville Rd., Laytonsville, MD 20882.